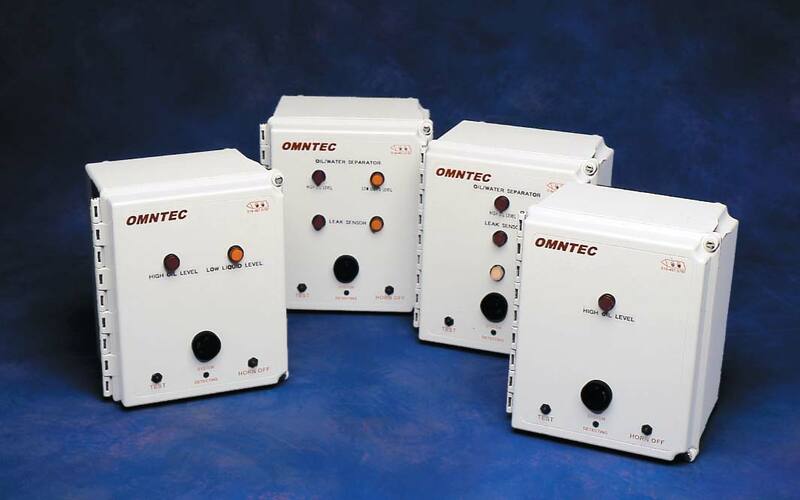 OMNTEC’s LU-OW controllers are designed to be used with oil/water separators. These audio-visual controllers monitor oil/water separators for the accumulation of oil to ensure that the oil level does not reach a dangerous volume and mix with the effluent water. The controllers are activated by float sensors, which are set by the user to match operational and site conditions. These controllers are easily tested and have an acknowledge switch on the control panel. The LU-OW product line is designed to fit a variety of sensor combinations. LU-OW controllers are high-oil-level controllers. LU-OWP controllers are high-oil-level controllers with pump-out capability. LU-OWIR controllers are combination leak-sensing, high-oil-level controllers. The LU-OWPR is a combination leak-sensing, high-oil-level controller with pump-out capability. The NEMA 4X rating of the LU-OW controllers indicates a weatherproof, corrosion-resistant product. The LU-OW controllers are ruggedly constructed to provide reliable and cost-effective performance.